We are entering a new era of accountability in medicine; all healthcare providers are increasingly defined by the results of the patient care they deliver. To ensure that Montefiore’s non-negotiable standards translate into the highest caliber of performance, Nursing Quality Management implements our philosophy, mission and goals with a customer-focused, interdisciplinary, data-driven, outcome-oriented and proactive program. Continuous performance evaluations rely on the plan-do-check-act (PDCA) model, under which nurses objectively and systematically monitor and assess the quality and appropriateness of the care they provide. Nursing Peer Review, one formal component of Montefiore’s nursing quality improvement strategy, reviews the relationship between patient outcomes, delivery of care, and established medical center and national standards. As part of this process, nursing peers review nursing practices, make recommendations and develop patient outcome improvement strategies in a collegial, nonpunitive forum. We conduct this peer review on an ongoing basis throughout all care centers at the medical center. Coordinated Care Management at Montefiore is a professional model of care delivery in which each patient's care plan is evaluated and implemented by an interdisciplinary team. Nurses, as the point-of-care providers, coordinate each patient's care plan with his or her physician. Nursing Quality Management is consistent with the philosophy, mission and goals of Montefiore. Our program is customer-focused, interdisciplinary, data driven, outcome oriented and proactive. We adhere to continuous, ongoing performance evaluations, using the PDCA model, to objectively and systematically monitor and evaluate the quality and appropriateness of all nursing care at Montefiore. 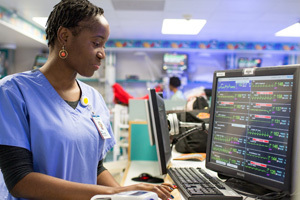 The Clinical Information System (CIS) provides Montefiore nurses access to cutting-edge technology designed to enhance the quality of patient care. The CIS includes an electronic medical records system, which enables nurses to visualize a patient's plan of care based on physicians' orders and move Montefiore closer to its goal of eliminating paper charting. Medications are documented on wireless portable input devices. Internet and intranet access to pertinent clinical resources, including journals and reference databases, is available on patient units.